Typically when one thinks of Kevin Ayers it’s places like Canterbury, Mallorca or the south of France which come to mind. So did you know about the Belgian connection? Kevin regularly visited Belgium and played many gigs and festivals there. The Starvin Marvin Band, who come from Belgium, toured with Kevin Ayers as his backing band on a number of occasions in the 1990s and early 2000s. Members of the band are: Marvin Siau, vocal & guitar; Alain Berthe, guitar; Patrick De Neve, bass; Ludo Huyghe, drums. SJL: When did you first become aware of Kevin’s music? MS: Think I was aware as a teenager of Carribean moon on the radio when it was released. But girl friends kept showing me the album’s of this beautiful blond adonis in the mid 70’s, and I noticed all these incredible musicians who played with him, specially Steve Hillage. The first album I got to know really well was during the punk age, yes we have no mananas, think blue really stunned me, Ollie’s solo, and than the choir almost sounding like blau in German, blauw (blow) in Dutch, hit! SJL: When and where did you first meet Kevin? MS: I was at the annual biggest rock festival in Belgium called Torhout/Werchter in July 1980. Headlining were the Kinks, the Specials, Mink Deville, Fisher Z and of course Kevin. My sports in those days was sneakin’ in through the artist’s entrence and clearin’ as fast as possible a backstage pass from one of the artists. I presented myself as a reporter from Rolling Stone magazine, which after a while they all knew I wasn’t, but I think they liked my girl friend, Annie Partyka, who took some nice pictures. Kevin willingly handed me over his address in Déià, which was meant for Annie I guess, as well as Willy Deville invited me to come over and stay with him in Paris for a while, which I gladly did. SJL: Can you tell me about the time you spent in Deia at Kevin’s house? I already have the photo of the “Happening Combo” of course! MS:You can write a book about that, I kept the turist pictures from the airport. The best one I remember, in the beginning I once arrived and Kevin handed me the keys of the house and his car and took of to the Carribean, I sat there for 3 weeks alone in his house, and had the opportunity to sit upstairs in his studio and listen to any tape I liked, play, record, whatever! I sensed a very magical magnetism from the huge mountains behind the village at certain moments. MS: First baptised “another time before” was part of the demo’s I send to Kevin in anticipation of what was going to be my first solo-album. The writing process is based on a strong déjà vù feel that I tried to describe one night. Trying to sense the heartache in some of us, which apparently was the breaking up of my band than I guess. Kevin always liked the song and 6 years later he rewrote my soft words and added one more verse to it, Ollie invented the intro & solo. I must admit that since that day I gained the greatest respect from Ollie, it broke the ice, I could retire. SJL: Can you say some words about Ollie Halsall and also about the talented and vibrant Zanna Gregmar? MS: 1 hour spent with Ollie would give me 3 months of playing pleasure, what he showed me would always open new sounds. When I first arrived in Deià Kevin was always glad to have someone around to play with, think I took advantage of Ollie’s absence being involved in other projects at the time. 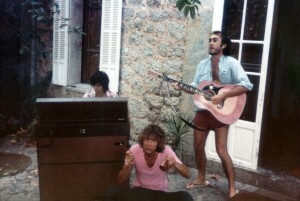 In ’82 I invited Ollie to play on my first single “Birdseeds”, which he did, on grand piano. Zanna was his musical partner in those days, always friendly, and I was very eager to hear what they all did in Madrid. 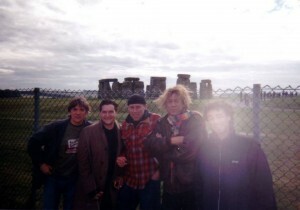 SJL: How much can you remember about the UK tours (I think that’s 2000-3)? MS: It started actually out in ’93, where I joined in on many acoustic evenings with Kevin, in Spain, France, Germany, Holland and the UK. Finally in ’99, I proposed him to let my band join in, and so it went. Many fab gigs, twice to Japan and 4 UK tours. The roadmovie shows a lot of that. It stopped just in time to save my liver! SJL:How has Kevin’s music influenced you? Do you have any favourite songs or moments when you played live with him? MS: He stopped me just in time to get hooked on the punk scene, for which I’m very glad he did. We had something in common, he liked my songs, and produced my first album. Later he would record one of my songs on Fallin Up, another rolling stone. He liked my remote place, and many time visited me to record some demo’s. I never expected to play with him, but after Ollie and Archie (Leggett) died he turned to me, probably because it never occures to me to take over on him and I knew how to play and direct most of his songs, I love them all! A huge “Thank You Very Much” from KevinAyers.org to Marvin for sharing these memories with all of us. 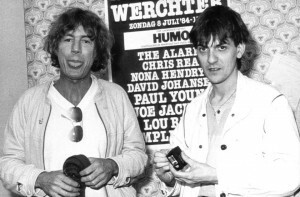 With thanks also to Ian Carpenter for access to his wonderful photo collection of Kevin Ayers memorabilia. 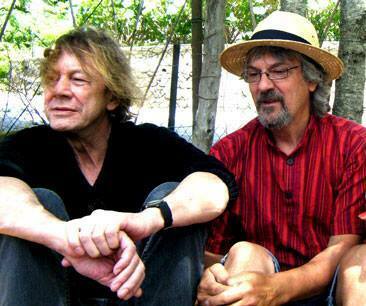 Various “unofficial” recordings of Kevin’s gigs with The Starvin Marvin Band exist: The Starvin Marvin Band Facebook Page and also Kevin Ayers – Mr Kyps, Poole, Dorset – October 25th, 2002. Sitting here in limbo at Philadelphia. Airport, it was wonderful to read this fine interview. Next post: How Kevin changed my life!